Submitted by Fuseblower on June 18, 2012 - 12:27am. Submitted by dylan.schouten on June 18, 2012 - 12:32am. I feel your pain. I don't actually work with sludge myself, but I've been elbow-deep in hot (dish-washing) water enough times to know the value of willpower. Well, either that or a clean, dry piece of cloth nearby. Submitted by Tupars on June 18, 2012 - 9:12am. Submitted by Fuseblower on June 18, 2012 - 11:43am. Gloves and engineering often don't work too well together - sometimes to the point of being downright dangerous if they get caught on anything moving. But it depends entirely on what sort of job you're doing; sometimes they're an absolute necessity, especially with anything seriously hot. Even oily rags are somewhat frowned upon nowadays for similar reasons - paper towel is generally preferred, and we keep a lot of that around (just the basic kitchen towel type is good for a lot of jobs). Barrier cream helps quite a lot with getting the muck off quickly though, and generally keeps your hands in better condition than they might have been otherwise, so I use this quite a bit. Real problem is remembering to apply it first thing in the morning! Submitted by replication on June 21, 2012 - 6:54pm. Ok, you have to be seriously kidding here. Gloves being dangerous? You really have to be joking! The whole friggin' point of gloves is to protect your hands. Would you rather it be your flesh caught on something?! Also, if you are working on something that has moving parts, close enough that your hands could become entangled, you are doing something seriously wrong safety-wise. The equipment should have been shut off and isolated before you go sticking your hands in there. Submitted by kabilin on June 22, 2012 - 5:34am. Any powertool with something rotating/spinning should be operated without gloves (sleeves should be tight or up or missing too). Next time you see a professional carpenter or a woodshop worker using a tablesaw, see if they are wearing gloves. Submitted by replication on June 27, 2012 - 6:19pm. Ok, I do not know what country you live in, but here in Australia it is a requirement to be wearing gloves when operating any power tool on the majority of construction or other sites. Actually most sites bar you from entering unless you have gloves on you at all times - any manual handling job? - Gloves. The only thing professional carpenters here get away with is wearing gloves that have the tops cut off the index and middle fingers as well as thumb. Submitted by Jin on July 1, 2012 - 10:34am. Gloves are a must for handling jobs like you mentioned - moving masonry, glass, lumber, etc. They're an absolutely terrible idea for power tools. A lathe can spin a 60 lb chuck at 2000 rpm - if just a little bit of your glove gets caught, you could be dragged into the machine before you can blink. It may sound morbid, but it's far better to lose a chunk of your finger than to lose the whole arm (or worse). The best solution for most is barrier cream and Fast Orange at the end of the day. Submitted by replication on June 21, 2012 - 6:55pm. Submitted by admirablearmstrong on June 24, 2012 - 10:31pm. Submitted by Ravenblood on October 13, 2012 - 12:44am. Yeah, but nothing beats the expression on someone's face when you zap yourself with one thousand volts in the middle of answering their question. Unfortunately the equipment I work on doesn't always have the best designs for troubleshooting, so you end up having to put a hand near the end of the high voltage probe as moving it a millimeter in any direction could short out the power supply, and the engineers often don't wait for me to finish what I'm in the middle of before they ask me questions. Submitted by Sage on June 18, 2012 - 12:12pm. Submitted by The Owengineer on June 18, 2012 - 7:04pm. At least you didn't try to use the bolt driver to scratch your face instead. Submitted by MisakaRailgun on June 18, 2012 - 9:48pm. Submitted by cvcharger on June 18, 2012 - 11:46pm. I know exactly what you mean. Stupid dirty work. Submitted by cvcharger on June 18, 2012 - 11:47pm. Sorry about that. For what ever reason it double posted. Submitted by SpacePodiatry on June 19, 2012 - 12:23am. I remember having a similar moment when I was doing my dissection module, getting an eyelash going into your eye while elbow deep in a cadaver was not the most fun experience. I ended up getting a lecturer to get it out for me.... fun times. Itchy noses will almost always happens during surgery, generally we have to ask the dirty nurse to help us out at that point. I think its probably the phenol we have to use, ah well. Submitted by replication on June 21, 2012 - 6:59pm. 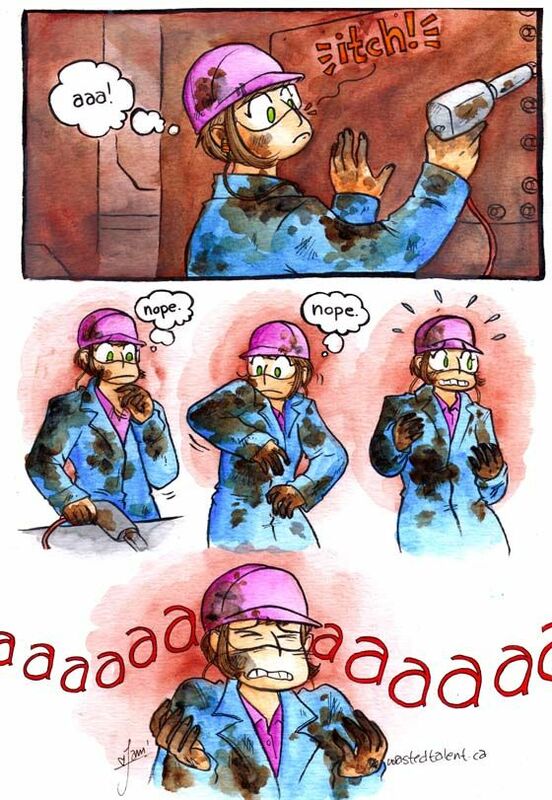 I am an engineering geologist and have been stuck in this situation way too many times! Covered in mud and soil from sampling and then get an itchy face... doesn't go well together. I usually end up just sighing and smearing my face with dirt. Smudging the safety glasses though. ARG. Nothing more frustrating, because there is usually nothing clean around me that I could remove the smudge with!